Police in Manchester have released CCTV images showing up to 200 football fans chasing officers and attacking one of them after the Uefa Cup final. The footage shows Rangers supporters tripping up the Greater Manchester Police officer and jumping on him after the match with Zenit St Petersburg. 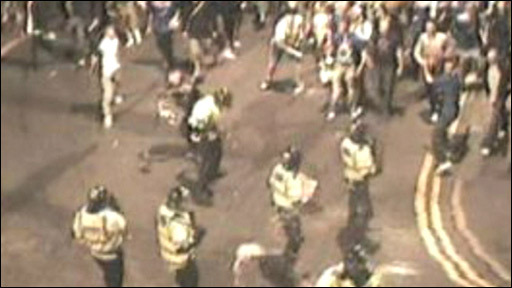 Assistant Chief Constable Justine Curran described the fans as being "like a pack of baying wolves". Eleven supporters have been charged with criminal offences. The charges include public order offences, assault and throwing a missile. A further 11 Rangers fans who were arrested have been bailed pending further inquiries. Twelve Rangers fans arrested were cautioned, and seven men, including one Zenit St Petersburg fan, were released without charge. Scottish Labour, Tories and Lib Dems have called for an inquiry. Scottish Conservative deputy leader Murdo Fraser initially said the decision to deploy riot police was an "over-reaction" which may have inflamed the situation. But he was later forced to temper his comments after viewing the CCTV footage. Ambulance crews dealt with 52 cases of assault after the match, in which Rangers were beaten 2-0 by Zenit St Petersburg. Assistant Chief Constable Curran said violent clashes were sparked when police officers came under a "severe level of attack". Riot police were deployed after a city centre big screen failed and several arrests were made, including six men who were held after a Russian fan was stabbed inside the City of Manchester stadium. The police officer whose attack was captured on CCTV footage suffered bad bruising to his arms and body and hurt his elbow. Greater Manchester Police said a total of 15 officers suffered minor injuries and a police dog cut its paw after treading on broken glass. Despite the scenes, council leader Sir Richard Leese said the city would not be put off hosting future international sporting events. Sir Richard said it was one of the biggest movements of people ever seen for such an event, and paid tribute to the authorities for the handling of the crowds. He also said there would be an inquiry into the failure of the screen in Piccadilly Gardens. The company behind the five screens erected in the city centre, Lightmedia Display, said the failure was due to a technical signalling problem. The city council said next week's Champions League Final between Manchester United and Chelsea, in Moscow, would not now be shown on big screens in Manchester. Uefa said Manchester did a "fantastic job" in staging the final despite the trouble. Communications director William Gaillard said: "Both the municipal government and Manchester police have done a fantastic job given they were faced with well over 100,000 fans coming from Scotland. "I can't believe that any other city would have done anything better." The general secretary of the Rangers' Supporters Association, John MacMillan, said he was disappointed with the behaviour of some fans. He added: "There is no excuse for it to be honest. From what I saw before the game there was no need for attacking paramedics and the police, it is indefensible." 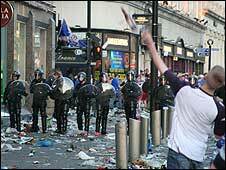 But Rangers Football Club said many of those causing trouble had no history of following the team. Rangers chief executive Martin Bain said: "Those scenes obviously are dreadful and I've seen them myself and we have been informed...that those scenes were caused by supporters that don't normally attach themselves to our support. "We're extremely disappointed and we'll do everything we possibly can to help police find out who those perpetrators are." 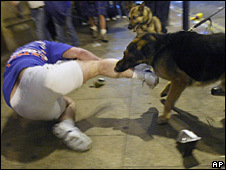 Rangers security chief Kenny Scott said the club would take "appropriate action" against those responsible.